OUTLANDER star Sam Heughan admitted he had to sweat off his excesses by flying out his Glasgow gym instructor to the States following a trip to the Oscars with Caitriona Balfe. The Scots born hottie admitted more than a few drinks may well have been consumed at the bash - and he was keen to get them out of his system. 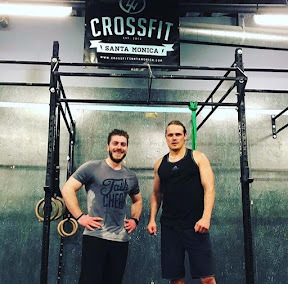 Sam was so keen to keep in shape that he got his personal trainer coach John Valbonesi from the fitness facility in Port Dundas to come to California with him. As the two did a workout in Santa Monica gym he told fans: "Post Oscar party sweat fest...Cheers Valbo Ugh. He also told William Shatner, tongue placed firmly in cheek: "No champagne was consumed. At. All." Sam has been a regular at the Everyday Athlete Gym and launched his charity fitness fundraiser My Peak Challenge there in 2014 with Valbonesi.